"They (RoundGlass Partners) are an extremely seasoned team that can provide us with both financial support and deep healthcare expertise. Over the last few months, we have monitored and tracked data patterns from daily activities of our users. We will use this data to further personalise our app and offer improved experience to our customers," Goyal told Techcircle.in. 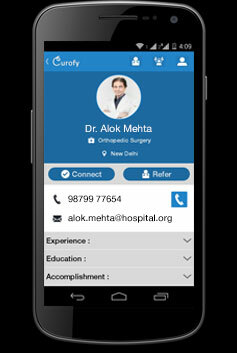 Curofy was founded by IIT Delhi alumni Mudit Vijayvergiya, Pawan Gupta and Goyal. It's an app-only platform that allows doctors to interact and collaborate on cases, apply for jobs and read latest medical news. The startup's medical directory pre-populates doctors' profiles based on public data. "With the rapid pace of medical advancement, it is challenging for practicing physicians to stay informed on the latest methodologies and research while simultaneously connecting with colleagues to share best practices," said Gurpreet Singh, founder, RoundGlass Partners. "The Curofy appâ€¦ is making it easy for physicians to share knowledge and holistically manage patient care." RoundGlass Partners is a Seattle-based VC firm that focuses on healthcare technology startups. As per VCCedge, the data and research platform of Techcircle.in, the Curofy investment would be RoundGlass' third known bet in India.